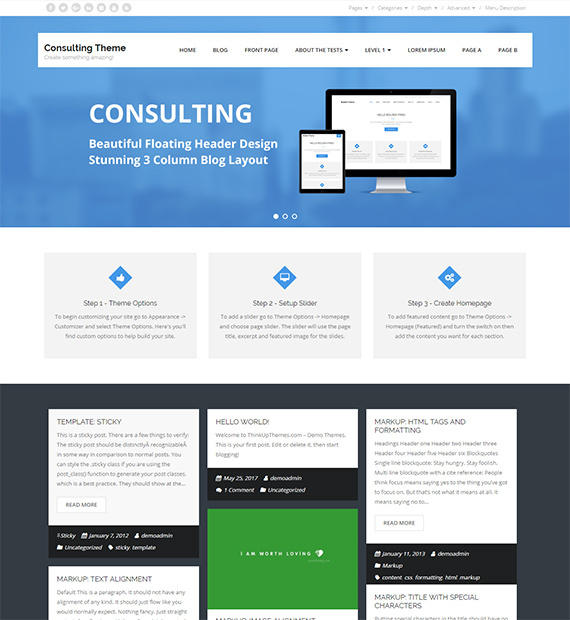 Consulting is a free to use theme featuring a clean and responsive design. The theme comes with a marvelous full width floating slider and integrated social icons. Its 3 column layout, background customization, and custom logo settings make it a great blogging theme. The theme also comes with a live customizer and over 10 native widgets that require little to no coding to use so setting up your site is made even easier. While the free version provides all the features, the premium version adds unlimited colors and sidebars, 600+ google fonts, 100+ shortcodes and more.